SOCCER: Clinton FC played out a hotly contested 2-2 draw against rivals Capricorn Coast FC at Apex Park on Saturday night. A win to Clinton would have given the team a 10-point buffer between them and Capricorn Coast. The game started well for Clinton, dominating most of the attack and possession of play camped in its opposition's half. Capricorn Coast goalkeeper Ged Kelly pulled off some outstanding saves to keep them in the game and frustrate the Clinton forwards, denying any goal conversion. It wasn't until after the half time break the scoreboard ticked over when Clinton striker Liam Stephen, making a driving run for the opposition goal was fouled and co-captain Chris Hill converted the penalty. Stephen again showed his attacking class when he beat a Capricorn Coast defender to find the back of the net for the team at the 61st minute. 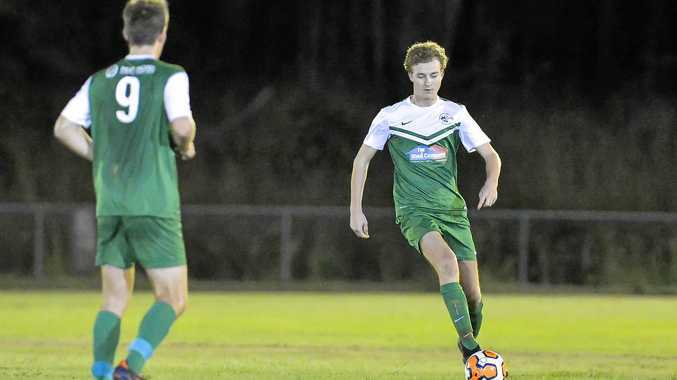 Capricorn Coast, buoyed by a passionate home crowd, stepped up its game and against the run of play and pegged back a goal after a superb finish by Jack Frahm. Stephen again tried hard to get another goal for Clinton, but was denied by a desperate Capricorn Coast defence on the line. Clinton looked to have the winning three points in the bag until ex-Clinton player Matt Simillie converted a goal which hit the underside of the crossbar and got over the goal-line. Clinton assistant coach Dan Horton was disappointed with the result given how dominant the team's attacking performance was. Co-captain Chris Hill was man of the match while Jakob Holmwood and Josh Noonan had strong games for Clinton.